Hi Michael, thanks for the great craps book and the fast delivery. The complimentary e-book, was a nice surprise too. More than I was expecting for free. Lawrence A.
I have never received so much value for so little money in my life. Michael, your kindness and the love you project in your teaching, will remain with me always. I went for a craps seminar and came away with an unforgettable lesson on life. Michael I hope you have been well since I’ve seen you last summer at Dice Busters. I was in Vegas last week on business. What has been working for me is charting and paying attention to the table energy. I must admit it took me awhile but I’m a believer now! I got up early before my meetings to hit a table and the first one I got to had horrible energy. I shook my head and said to myself, this is Vegas, there is another game just around the corner. (You said that) So I walked across the street and the table there only had two players but the energy was electric. Within 10 minutes the shooter was aggressively pressing is bets and won $20k before coloring up. I was up $350 and was very happy to end the session. It was awesome. Thank you! Michael I hope you have been well since I’ve seen you last summer at Dice Busters. I was in Vegas last week on business. What has been working for me is charting and paying attention to the table energy. I must admit it took me awhile but I’m a believer now! I got up early before my meetings to hit a table and the first one I got to had horrible energy. I shook my head and said to myself, this is Vegas, there is another game just around the corner. (You said that) So I walked across the street and the table there only had two players but the energy was electric. Within 10 minutes the shooter was aggressively pressing is bets and won $20k before coloring up. I was up $350 and was very happy to end the session. It was awesome. Thank you! Stack and Rack is perfect! Michael, what a great trip I had yesterday. I went up and played for only a few hours and took almost 2x my session units home at one casino and a fair amount at another. I did what you recommended and walked the casinos, then picked one and played for 1 hour, walked some more and played another 1.5 hours at another casino, almost the entire extra .5 hrs being my roll (busy table and over 14 rolls -- I lost count).My rolls are getting better, naturals come more often on come out and box numbers seem to stick with inside numbers with the dice setting you showed me (6 on the side, not the paper chart). I've changed up the basic betting strategy you showed me and stick to playing in units. I made my win potential just a bit smaller but at the same time gave myself more time to play. I might do this until I can increase my bankroll to a comfortable amount. So like you said, find a strategy that I'm comfortable with, play within my bankroll and enjoy the wins. Stack and Rack is perfect! Thank you for helping me improve my game, I think I've got a good future in playing craps for fun. Now just to build out my table and get more practice in. Michael, what a great trip I had yesterday. I went up and played for only a few hours and took almost 2x my session units home at one casino and a fair amount at another. I did what you recommended and walked the casinos, then picked one and played for 1 hour, walked some more and played another 1.5 hours at another casino, almost the entire extra .5 hrs being my roll (busy table and over 14 rolls -- I lost count).My rolls are getting better, naturals come more often on come out and box numbers seem to stick with inside numbers with the dice setting you showed me (6 on the side, not the paper chart). I've changed up the basic betting strategy you showed me and stick to playing in units. I made my win potential just a bit smaller but at the same time gave myself more time to play. I might do this until I can increase my bankroll to a comfortable amount. So like you said, find a strategy that I'm comfortable with, play within my bankroll and enjoy the wins. Stack and Rack is perfect! Thank you for helping me improve my game, I think I've got a good future in playing craps for fun. Now just to build out my table and get more practice in. Thank You Sir: Have played now 3 times with P4K Ha!! It is what I suspected for the last 11 years but was afraid to think about. 3 time's out 3 winners. But it is still not like playing at home. My minimum bet is Ph 300. That means 3 one hundred peso unites = one minimum pass line bet without odds. They have weird rules about odds, our dilemma here in the Philippines. It will take 3 more session's to understand it. But, Amen!! Just follow the vibes P4K. It just makes "Pesos". Also about betting: Minimum is 3 100 peso units with four times odds 300 peso is about $ 7.50. Thank you, for everything you have taught me and Jason. You Sir, are a wealth of knowledge and I feel we were truly blessed to have met you. You were patient with us learning and you made sure we got it. We are still soaking in all of the knowledge you shared with us. Wish we had more time. Thank you again for all of the patience, the knowledge you shared, the great lunch, and the extra blackjack book. Also for great hospitality. We will keep you posted on our trips to the casinos. Hopefully, one day we can stand side by side at the tables and take their money together. Until next time Michael, take care and see you soon. After a few year hiatus from Cripple Creek, I have gone three times recently. Like riding a bike, it came back easy. Walked away with a profit each time but more importantly had a great time. “Playing 4 Keeps is like getting a golf lesson from Tiger Woods. I already had a pretty good swing, but the tips from a pro like Michael, allow you to take the game of craps to a whole new level of intelligence, confidence, and discipline. There are a lot of good swings out there, but the difference is in a grip and stance you can count on. 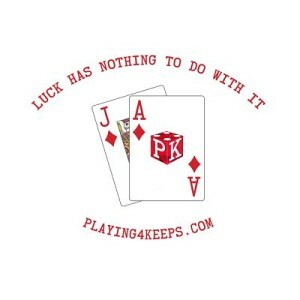 Playing 4 Keeps is just that!” Thanks again and maybe we’ll see you in Vegas!! Hello Michael, I have to say though, as I was reading some of your articles that you wrote, you explain yourself very clearly. That was one of the main reasons why I purchased your dice playbook. Sending you a big "THANK YOU!" in advance for all your research, lessons, and help on playing the game of craps. Keep up the good work. A thankful customer. Michaels' approach to the game of dice reveals the hidden dimension behind the action. His money management discipline guarantees that you will be in the game when the big energy hits. Combining this with the metaphysical aspect you are taught to know who the true players are and when it's time to play or walk away. I came away from a Do's and Don'ts of Dice seminar feeling a total winner, confident in the knowledge that I had learned the finest Dice/Money management/Metaphysical system being taught today. Michaels teachings not only showed me a greater understanding of winning at dice, but he also showed me how to apply what I learned to every aspect of my life. Thank You, Michael, for a great weekend. David W. - Castro Valley, California. Mr. Vernon, Just a note to say thanks for the "Chronicles". I read them with great interest there were some good things that apply to my game. I'm definitely an under funded player. I play craps at the Horseshoe in Cleveland and their table minimum is $15, which is way too steep for my bankrool. But using the P4K I can at least enjoy a chance to play and if I can find the "hot shooter" I've racked up some nice wins. Following the energy, when the table is cold, I go home early. I really am interested in applying the metaphysical approach. I'm reading some books by your friend Stuart Wilde. What a great mind! I will be trying to apply the concepts. When I make the big hit I would like to try one of your dice seminars. Thanks again! Mr. Vernon, Just a note to say thanks for the "Chronicles". I read them with great interest there were some good things that apply to my game. I'm definitely an under funded player. I play craps at the Horseshoe in Cleveland and their table minimum is $15, which is way too steep for my bankrool. But using the P4K I can at least enjoy a chance to play and if I can find the "hot shooter" I've racked up some nice wins. Following the energy, when the table is cold, I go home early. I really am interested in applying the metaphysical approach. I'm reading some books by your friend Stuart Wilde. What a great mind! I will be trying to apply the concepts. When I make the big hit I would like to try one of your dice seminars. Thanks again! Dear Michael, Thank you for the June 2008 issue of Playing4Keeps newsletter. I think I've read every articles. As always, it is filled with great ideas, hints and wisdom. After reading your Do's and Don'ts Play Book, we took a trip to the casino yesterday, left after two hours of playing as winners! I succeeded in pulling my husband, Michael, away from the cold table. Michael, Thank you for the great private dice lessons you have given me. I look forward to coming back one day and learning more advanced skills from you. After finding "The Professor" on the web, we began by exchanging emails and subsequently phone calls. I liked what I was hearing enough to "GAMBLE" the cost of a few hours tuition as well as my travel costs. Now, I may have been well studied - but I fully admit I was definitely not too widely experienced in the real casino environment. My hope was that my time with Michael would confirm I was on the right track and ready for some successful live action. Perhaps you have had the following experience, as I have had many times. You are sitting in some daylong seminar - saying to yourself, "I know all this stuff - what am I doing here?" Then suddenly...BAM! The presenter drops what I call a "pearl" that hits home and sinks in. These little pearls of wisdom are why we should never forget, "You can learn SOMETHING from everyone." Michael gave me perhaps 3-4 pearls during our time together. He showed me how to "anchor" my tossing hand so I could build better consistency in my tosses. This has been of enormous value to date. He tweaked my preferred method of betting adding in to the mix the best way to handle pass line wins. I have already hit 4 great wins with this adjustment to my play. Michael exposed me to the metaphysical side of the game that I was not even paying attention to. In the most basic terms, he taught me to be AWARE of what is happening and what is ABOUT to happen. And lastly - he gave me INTENT. I quote his own words here from an email I received from him, " Results come from consistency, belief, confidence and intention." Thanks to Michael I now have the INTENT to influence the dice every time I toss. And that intention and confidence is paying dividends. Over my last six sessions of live casino play - I have won $3200 - (over $2200 in one amazing session alone, while I was tossing the dice) - and that is using $10 starting pass line bets - just wagering properly and intelligently. Is that just dumb luck? Or perhaps was it my INTENTION to win? I read your Do's and Don'ts of Dice book with great enthusiasm and learned so much. After catching up on some work, we took a trip to Casino Niagara. It worked, Michael! I was a little scared at first for betting big odds but soon my fear were gone when I began to be paid in green chips! What a great feeling. We were not discipline enough to leave when table turned cold so gave some of them back to casino. Still left as a winner. However, this was good lessons as well, things not to do. Michael, just want to say how much I enjoyed the Do's and Don'ts of Dice class with you last weekend. After coming home, I have had two sessions, winners both times. Thanks for the follow up with us after our one day dice lesson with you. It was nice to see your check-up email. J and I don't get much practice time together, however I did see where P4K could take us. Share the post "Dice Testimonials"